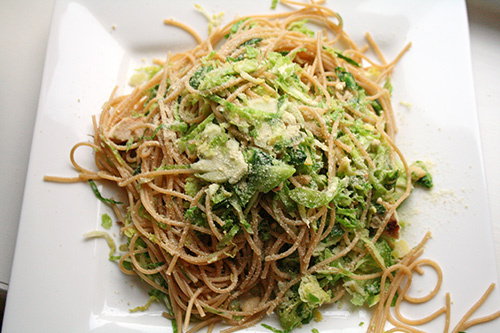 Here is a delicious pasta dish, with shredded brussel sprouts and toasted pine nuts, a winning combination. The brussel sprouts have a deliciously nutty/slightly peppery flavor, and everything works well together in this dish. In a food processor fitted with slicing blade, slice the brussel sprouts into a fine hash. Set aside. Place a large pot of salted water over high heat. While the water is heating, prepare the pine nuts. Place a large heavy skillet over medium heat; when warm, add the pine nuts. Shaking the pan frequently, toast until golden and fragrant. Transfer to a small plate; set aside. When water boils, add pasta and cook until al dente. While pasta cooks, prepare the brussel sprouts. Return the skillet to the stove, and place over medium-high heat. Add olive oil and margarine, then add the brussel sprouts and salt. Saute, stirring frequently, until bright green and just tender, about 4 minutes. When pasta is ready, drain but reserve 1/4 cooking liquid, and add it to the skillet with the brussel sprouts. Then add the pasta and toss with the brussel sprouts. Add the pine nuts and creamer, and toss once more. If pasta seems too dry, add a little cooking water. Alternatively, if you have any broth in your cupboard or fridge, you can use that instead. Serve immediately with grated soy parmesan. Makes 4 servings. PS – I added some leftover grilled chicken strips cut up into bite-sized pieces – a complete meal! Yum! I hear hashed brussels sprouts are the “in” way to prepare them this season. I still haven’t given it a go yet (although I love those babies roasted) but this looks like a great pasta dish to start off with! I am very happy you are back. I have moved my blog since you were away. I am now at http://www.baronesstapuzina.com. This dish looks delicious. I am going to try this. Italian dishes are the best, you can also make pesto sauce with pine nuts inside that will at a creamy rich flavor few can resist.